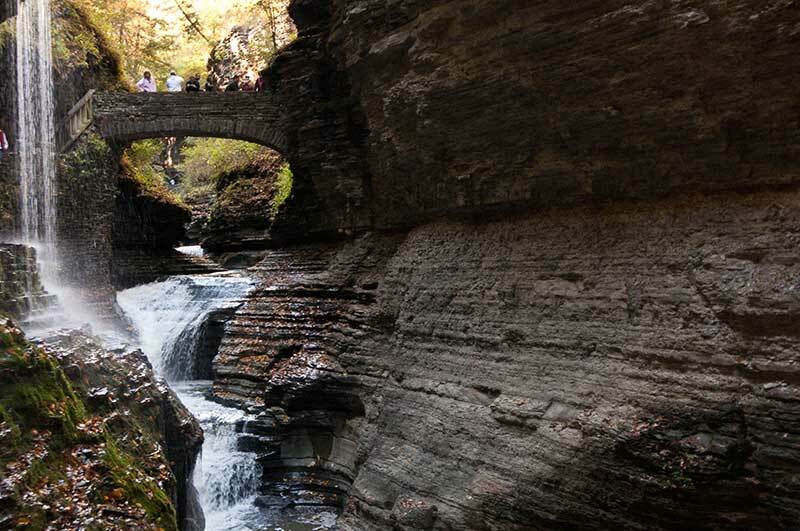 Escape to Watkins Glen in Upstate New York's Finger Lakes Region! Watkins Glen is a charming village at the southern tip of Seneca Lake, one of the magnificent Finger Lakes in central New York. It is a land rich in history, entertainment and natural beauty. Visitors enjoy taking a stroll behind the magnificent waterfalls at Watkins Glen State park, located on beautiful Seneca Lake. Aside from its 19 waterfalls, the park also boasts a deep, rock-walled canyon, which captivates visitors from all over the country with its breathtaking beauty. Seneca Lake and nearby creek offer a rewarding fishing experience, where visitors can catch an abundance rainbow trout and a variety of other fish. The Watkins Glen State Park also offers an array of campgrounds, providing over 300 campsites to choose from for those seeking an outdoor-vacation adventure. Watkins Glen is also home to an international raceway, which is why it's known as "The Home of American Road Racing." Racing fans from all over the nation gather in Watkins Glen to witness NASCAR, SCCA and many other thrilling races. With all these sites to see and plenty of great restaurants and hotels, Watkins Glen is a wonderful location for fun-filled trips and vacations.